This view of Plaza Street, looking southeast from Spear, shows the Excelsior Hotel and the Carson Opera House. 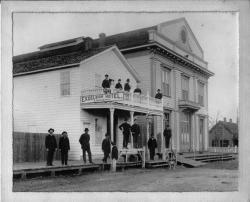 The Opera House was built on this spot in 1888 after it was kicked out of its old perch on Carson Street by construction of the post office (now Laxalt Building). The opera house burned in 1931. The Excelsior Hotel was torn down some time before that.